These little things...So addicting! So quick! So rewarding! And so pretty! I was in need of something to keep my mind and hands busy while I was away from home. It was a last minute idea to take something along to stitch, so picking something simple was a must. I settled on 2" diamonds that would be arranged in diamond hexies. Fabric needed to be something bright and happy. That's why I settled on Kaffe Fasset. It has a big bang for the buck! There was no plan on what I was going to do with these when I started, and there is still no plan! It was suppose to be a long term project! You know, something to pick up now and again. It appears that isn't how it's going to play out! 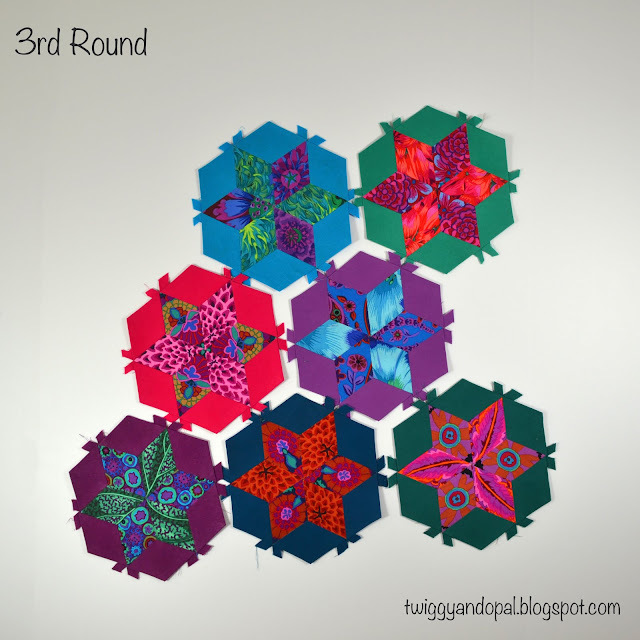 The first round consisted of nine Diamond Hexie Stars. At this point I was hooked. This was not suppose to happen. I wasn't suppose to get attached, to fall in love...it was meant to be a brief fling. Round two was quite a bit more serious. More of a romantic relationship began developing rather quickly. Be still my heart! Is it possible that the third round was a cooling off period for us? Were we moving too quickly and needed to take a break from each other? Hmmm...I don't think so. If anything we settled in to a comfortable arrangement and will take it one day at a time. At this point with Round four, we have an unspoken commitment. There is a comfort level having my EPP tote next to me every night. I can glue baste one night and start stitching the next. What I like to do is stitch a batch of the center stars and then go back and add the solid diamonds. After which I pop out the templates from the star and use them for the next round. 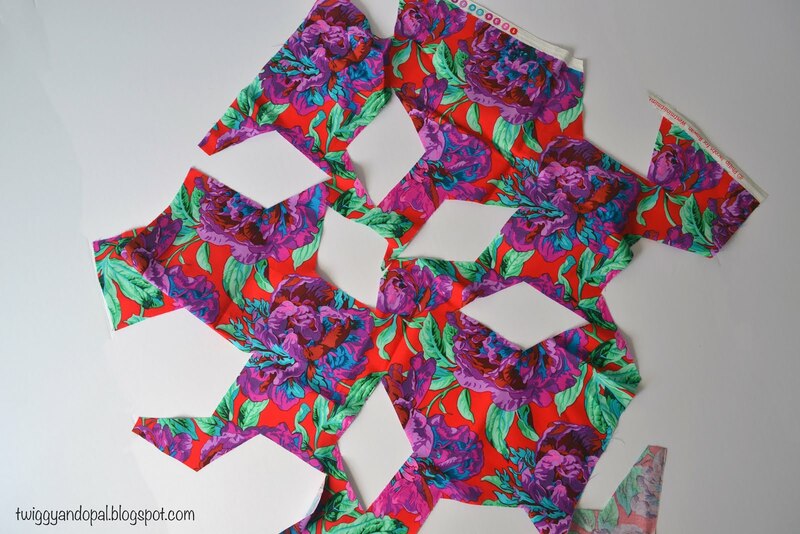 The outside templates stay in until after all of the hexies are stitched together. Round five is another day in paradise! Our relationship is solid and strong at this point. And it should be after 41 blocks! I have stacks of diamonds lined up for then next month, but after that I can't be sure what will happen. Since I'm making to make and haven't a solid idea in mind, I'll play it by ear. 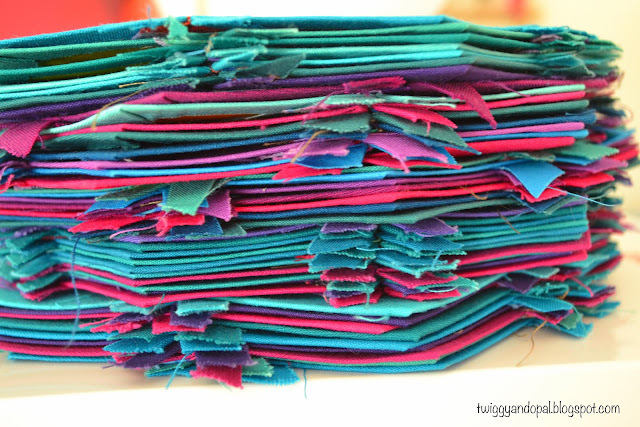 This is what most of my Kaffe fabric looks like these days! Swiss cheese! It is getting harder to find the perfect cuts when it gets to this point. I'm not giving up, just getting more clever! 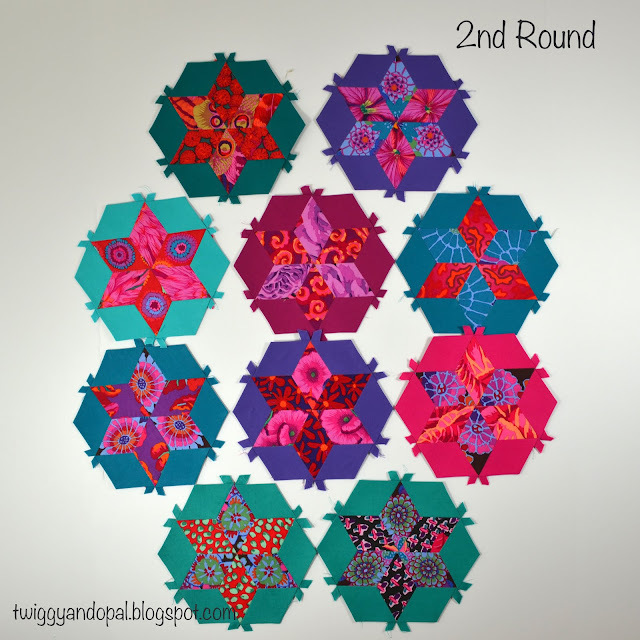 I think the obsession began at round 2. ha ha ha But the blocks are amazing. I’ve gotten a bit carried away! But, what else am I going to do in the evenings? The blocks go together pretty quickly which means the payoff happens fast and keeps me coming back for more! These are lovely, such beautiful jewel tones. I'm doing the ice cream soda EPP project, never thought I'd be a fan of fussy cutting, but suddenly a lot of my fabrics are full of holes. It’s been so much fun! Fussy cutting can be so much fun and resulting in some gorgeous EPP’s! I bet your Ice Cream Soda blocks are amazing! 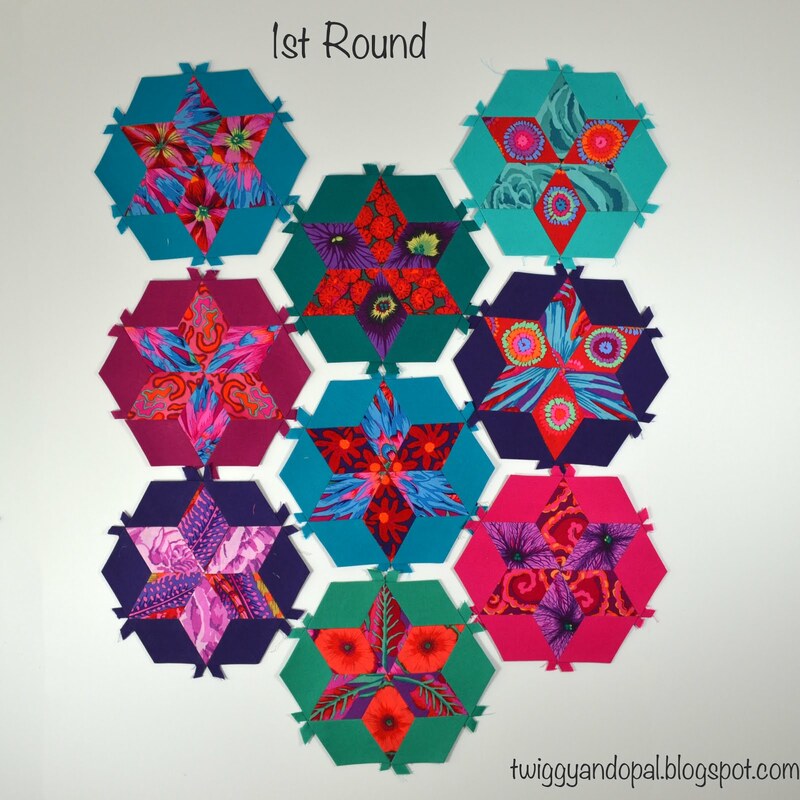 I love the rich jewel tones solids and the vivid Kaffe fabrics you used, the quilt is going to be stunning. I haven’t figured out what I’ll do with all the blocks, but I’m sure when it’s time it’ll come to me! The bright and happy solids go so well with your Kaffe fabrics. What a beautiful project. I can see why you can't stop working on it. It’s been a fun process in every way with these blocks. I should never say ‘long term’ project in any sentence when it comes to quilting or fabric…it never turns out to be long term in any way whatsoever! I was thinking the same thing as your other commenters - I love the solids with the bright Kaffe fabrics! Fun story, too! It's good to find new things to love! I thought the solid would tame the Kaffe prints just enough! I may have gone over board with my story, but sometimes quilting becomes a love affair! Whatever the end result, your quilt will be eye poppingly colorful and dynamic. Of that I am certain. Your solids frame the prints nicely. Will be waiting to see the finished product as you have pulled us all into your little affair. Hope your hubby isn't too jealous! These are beautiful! You are really working through these at a great pace. Soon you will have enough for a quilt. Thanks for sharing with Oh Scrap! Your blocks doubled in beauty with the love-struck sentiment accompanying them--soul food as well as eye candy is such a rewarding combo. Can hardly wait to see what becomes of the "Swiss cheese!" Beautiful choice of colours and prints ! That's exactly the way I felt when I started my hexie EPP project! I have a box full of hexie pieces. None of them are sewn together yet, and there is no plan at all, but I love the meditative quality of hand stitching those lovely little pieces. I adore your star flowers and know that whatever you do with them it will be amazing! 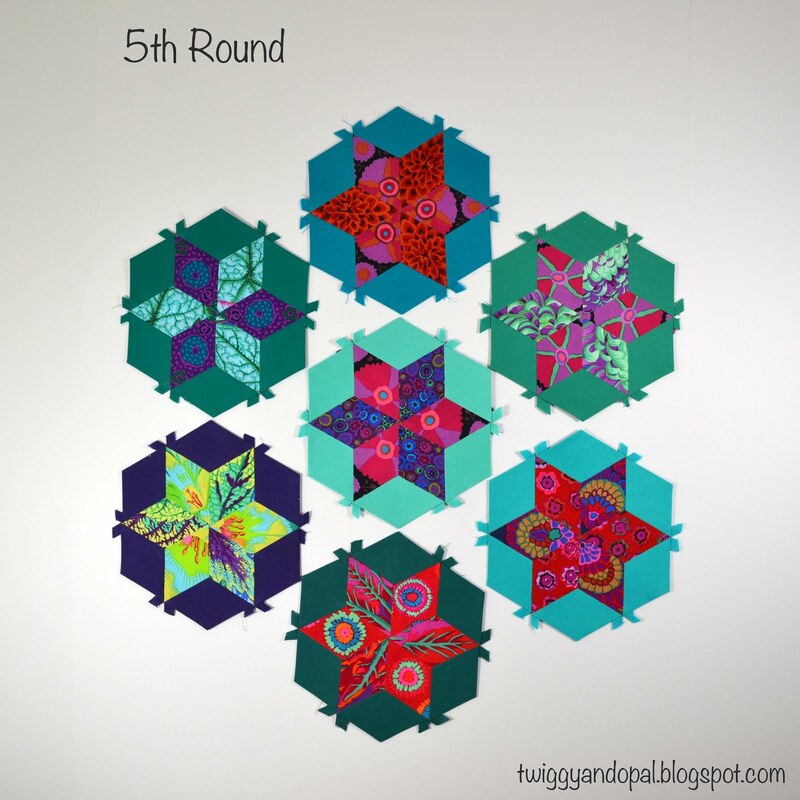 These remind me of looking through a beautiful kaleidoscope! I can hardly wait to see the final results. I too love EPP but my LTP is a Cathedral Windows quilt, to someday adorn the queen size bed in my guest room. I chose white for the main color and different fabric for every window. Crazy right? It has been quite the chore to find 3" squares with no repeats for all of those little windows. I. find hand quilting to provide a feeling of peacefulness and tranquility. 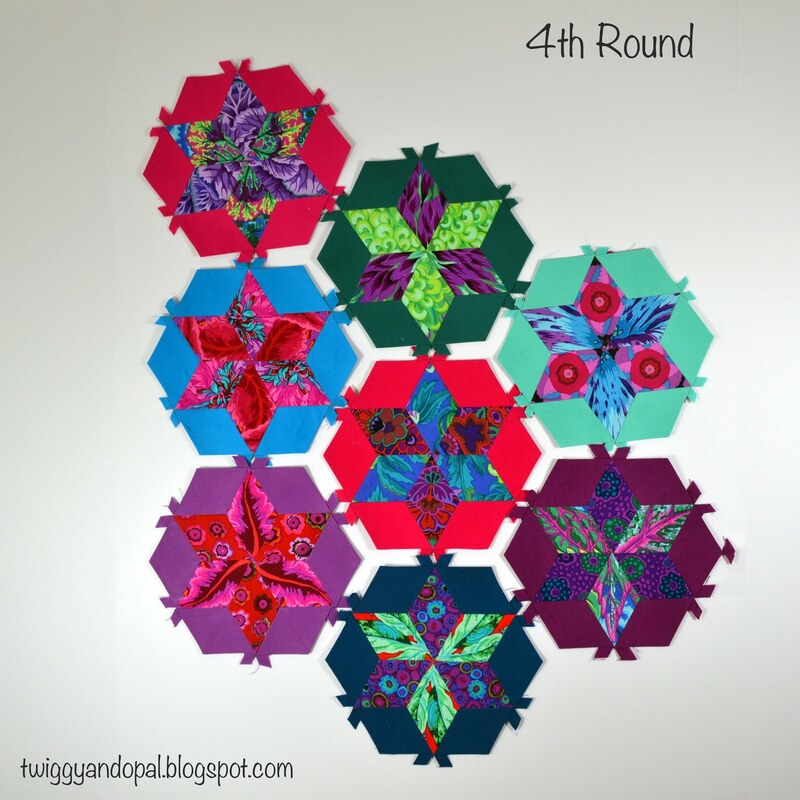 Your Diamond Hexie Stars are stunning! They are looking stunning. The colours are so vibrant. It will be interesting to see where this leads. The solids are perfect way to frame the beautiful Kaffe fabrics! What started out as an innocent fling is a full on committed relationship I think. Watching all these Kaffe fabrics blossom into these block is a beautiful thing! I can't wait to see where this keeps going, but I know one thing, it's 100% built on love and it will be beautiful! The honeymoon isn’t over yet! This project not only is fun and pretty quick, plus keeps me out of trouble. It has a deep connection to me because of the circumstances why I started it in the first place. It’ll be one I cherish for a very long time! Great colour choices here. I'm not a big fan of Kaffe but the solids work so well with them. I admire your ability to do hand work - I find it just isn't for me. I do want to try EPP sometime, but haven't yet. What a fun post!! You are creating something really special Jayne. Keep going - the finish will be spectacular. Perfect use of Kaffe so it isn't overwhelmingly colorful and bold. Just genius! Oh, you can try to side-step the issue by your sweet talk. Flirting, relationships, cooling off, comfort - I am not buying it. Just admit - it was LUST at first sight and you fell hook, line and sinker. Your passion comes through in each fussy cut block. I wouldn't want it to be any other way.